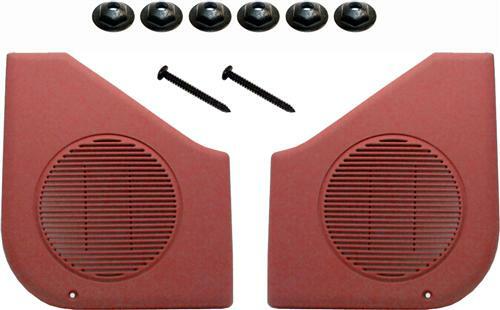 1987-1993 Mustang door speaker grille kit will restore your fox body door panels to new condition! 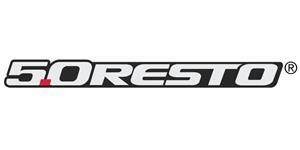 These 5.0 Resto 1987-93 Mustang Door Speaker grilles are located at the lower front of each door. Because of where they are located, they are normally popped loose from the door or scratched up from your feet hitting them. 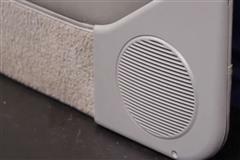 If your speaker grilles are puling away from your door panel, it is likely that the retaining tabs have broken off. The proper way to remedy the problem is to replace the grille. These install kits include everything you need for a seamless install. These speaker grilles are molded in scarlet red plastic and must be painted to match any other interior colors.